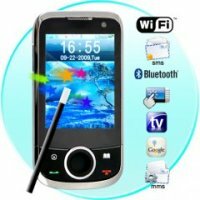 You know you’ve more or less have one of those weird phones when it comes with an extremely long name – how about the Beatle Quadband Touch Screen Dual SIM Wi-Fi Media phone for starters? This has nothing to do with the Fab Four, although it seems to cram in as many features as possible including Wi-Fi connectivity, Google Maps to help you get around, a variety of instant messaging programs, Bluetooth support, dual SIM card slots to make sure you can be contacted around the clock and global quadband GSM connectivity, perfect for those who travel from one time zone to another all too frequently. You also get a 2.6″ touchscreen display, a microSD memory card slot and an accelerometer among others to get you started. Best to buy this in bulk if you want a good price, otherwise it is going for $124.59 a pop.